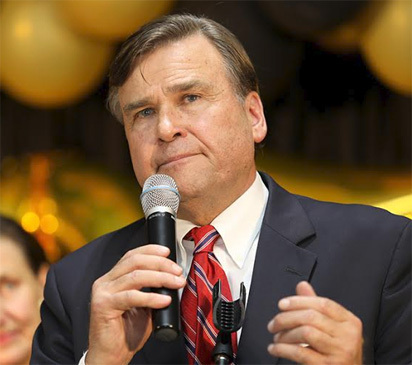 Stuart Symington, US ambassador to Nigeria, Wednesday replied the Director, Strategic Communications of President Muhammadu Buhari 2019 Presidential Campaign, Festus Keyamo, SAN. In a brief riposte, Mr. Symington debunked the statement credited to Keyamo that he (Symington), abandoned the impartiality of a true envoy and has trespassed into interfering in Nigeria’s electoral process. He unequivocally opined that the United State is apolitical and neutral in Nigeria’s election, noting that U.S does not support the presidential candidate of the Peoples Democratic Party, PDP, Alhaji Atiku Abubabar or any candidate as postulated by Keyamo in his letter. Recall that Keyamo had said that “We take the view that the constant statements by Ambassador Symington and the other diplomats are implicit attacks against the government of Nigeria. These statements imply the Nigerian government is inclined to rig the election in favour of President Muhammadu Buhari. But in his reaction to the above, Symington averred “The United States Embassy in Nigeria wishes to reiterate unequivocally that we are not taking sides in Nigeria’s election. We do not support any party or candidate,” the statement read. “We support a level playing field and the democratic process. That is the bedrock principle of our Government’s advocacy on democratic elections. “In the final run-up to the Feb. 16 vote, fake news and rumours are operating in overdrive. But it must be repeated: we are not taking sides. “This is Nigeria’s election and the citizens of Nigeria will decide who will lead their nation. It is important for the future of every Nigerian and it is important that every Nigerian contribute to making it a democratic, peaceful, free and fair process. “This will ensure that all Nigerians see the results as credible, and they accept them. This will empower Nigeria’s democracy going forward, as did the elections of 2015. “The United States is Nigeria’s long-term and enduring friend. We provide more than $1 billion in assistance and help save more than 2 million lives of Nigerians each year through our health and humanitarian assistance. This will not change. We are Nigeria’s good partner, and this will continue after this democratic election – no matter who wins. “This election is Nigeria’s, but it is also important for Nigeria’s neighbours and for the world. Nigeria has long played a great leadership role in the region and beyond as a force for democratic stability. “The credible electoral results of 2015 empowered Nigeria to play that role. The United States looks forward to a similar result this week. “We support the democratic process and the work of the Independent National Electoral Commission in managing the elections. We call on every Nigerian citizen, official, party member, and the security forces to peacefully support Nigeria’s democratic process in accordance with Nigerian law. “The United States welcomed the signing of Peace Accords by the candidates for President and other offices. Now is the time to grow that peace by ensuring all get the message and put it into action so that both the voting and the aftermath are peaceful and fully respect the democratic process.